Floral and Fruit wallhangings created by artist Jackie Haliburton of Gastown’s Angel Handpainted Fashions [www.angelpaint.com] also can be used as picnic tablecloths. 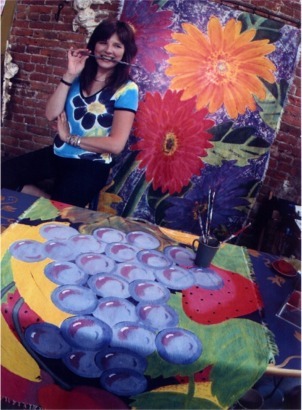 Vancouver Artist Jackie Haliburton creates spring on clothes. Angel, 2 Powell St. – Handpainted canvas, fringed, washable. These are intended as wall hangings but can be tablecloths or picnic blankets. Ask for custom work if for a family reunion picnic or anniversary. Keepsake value. Priced from $100 to $1,000 based on time taken to design/create.